This shoe came out either 2000 or 2001, well at least I am pretty sure. Sometimes it all runs together. 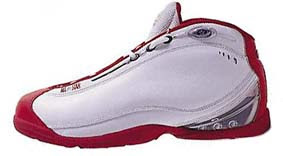 However, these shoes did feature Helium which puts them in the 1999-2002 span. I must admit I passed on these, and I am not really sure why. I just remember thinking that if this was the direction Converse was going with Helium, I was excited for the future. These shoes had some pretty exciting features for a Converse shoe at the time of release. It has a simple design, which based on the He:01 and He:02 was a different approach. They also have visible Helium unit on the heel and outsole. 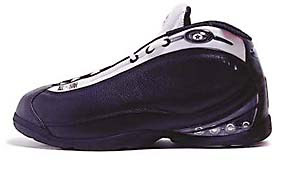 Sadly I must point out that the Elevate also featured brand new midsole and outsole patterns, something at appeared to be rare for Converse at the time. You will also see the Star in Oval logo used on the early models for the Helium shoes. I do apologize for the late posting today, and lack of pictures. So if any of you out there had these shoes, or better yet worked on these shoes contact me and we'll converse about them. Anywho, I was going to announce a goal for the end of the year, but hits have been coming in so much recently I might have to rethink the goal. Regardless, thanks for stopping by and please leave comments and suggestions for making the Converse Blog better.